Relax and wait for magnificent sunsets! Our private beach is 300 yds out, Cold Storage to left, PT r.
Fireworks, marshmallows, s'mores at the beach. Get permit! 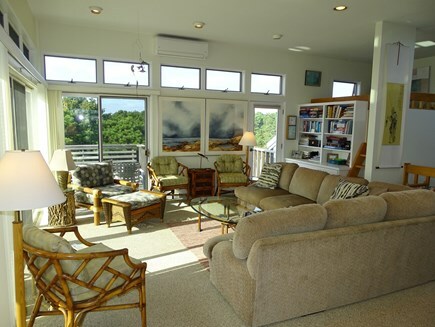 One of North Truro's finest properties has both water and scenic landscape views from its perch on an extensive landscaped and grassed lawn great for croquet, playing catch, or simply hanging out reading in the hammock under a beach pine tree. Pristine, beautifully maintained and graciously appointed with full amenities for discriminating and caring guests. Wrap around, elevated and furnished decks extend the home's spaces beyond the glass sliders in three directions. Rewards are the exceptional Truro ''light'', spectacular, memorable, and lingering sunrises and sunsets, sighting an occasional whale in the bay, or fish in a frenzied strikes of the blues and strippers. Twine Field is a special historic place where the early Truro fishermen repaired their nets. 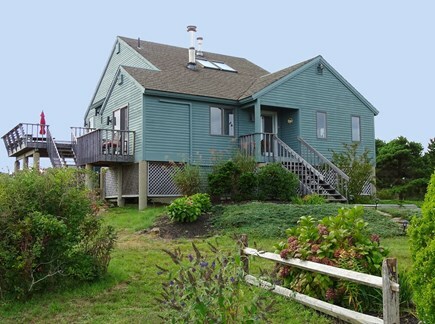 This home is located at the ''wrist'' of the Lower Cape. 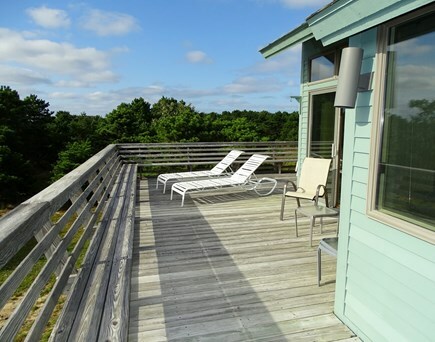 The distance from ocean to bay is 3 miles so there is easy access to both National Seashore beaches and the more gentle bay beaches. 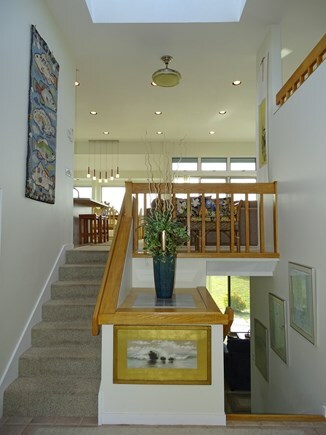 The house has its own private deeded beach 300 yards from door to water's edge. The kitchen boasts new appliances (not yet photographed), glass top range with two ovens (one full oven and a pizza oven)with built in microwave above. 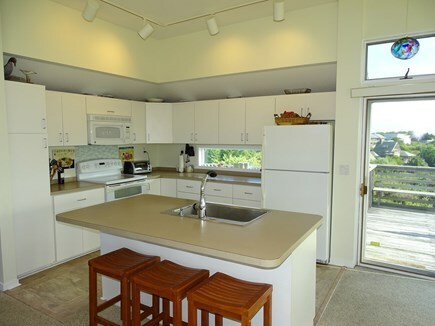 Cook's kitchen has coffee maker, toaster, toaster oven, waffle iron, Cuisinart, blender, electric mixer, lobster pot, propane lobster boiler for outdoor cooking, abundant pots and pans and bakeware, dishes, silverware, glass ware, stemware, and gas grill on ground level patio with table and chairs. House is HEPA cleaned seasonally, and fully air condition with clerestory windows allow for cool breezes no matter how hot the weather. A wonderful multi-level ceiling fan pulls air where needed. Many sliders out to decks surrounding top floor. One upper BR has slider to its own small deck. den and a lower bedroom have sliders to ground level as well. We are walking distance to Grozier Sq, SALTY'S Market with sandwiches, wines, newspapers, bakedgoods, sandwiches, and produce. There is a fish restaurant and a chocolate company with a small cafe, the bus to P-Town, and the pond where the Pilgrims spent their first night on the Cape. We grab a newspsper and cup of coffee at Salty's and sit by Pigrims Pond to start our day. The library, Senior Center and fabulous playground are less than 1/2 mile away. If you are fit,the dedicated bike trails are wonderful. Highland links (golf with ocean views), the Highland Lighthouse, the Truro Historical Museum should not be missed. Ocean beaches are 3 miles from our private bay beach. Natl Seashore beaches are in P-town. You can enjoy the ocean in the morning and the bay in the afternoon. Don't forget the many swimmable ponds. This home offers the maximum of multi generational privacy. 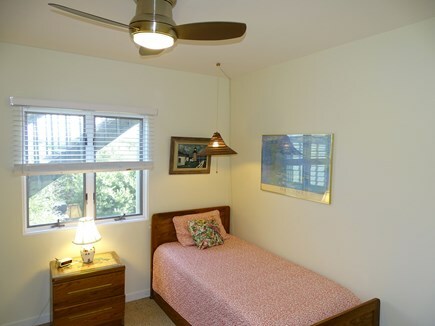 The lower level has it's own entrances, two twin-bedded rooms and a den with large TV. The expansive yard, the barbecue patio and the outside shower can be accessed from this level and also from the deck steps. The upper level is the family area. It is surrounded by walk out furnished decks. There is a small loft area above that is ideal for private talks, reading, computer space, or an inside getaway. play. 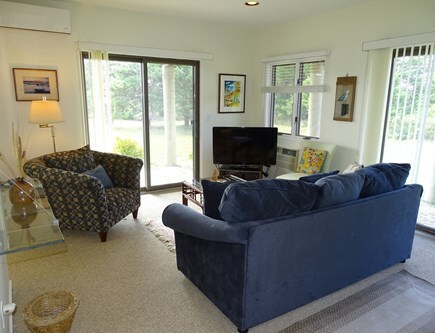 We are 20 minutes from Wellfleet, with all it's art galleries, restaurants, and shops, reknown flea market,cinemas (one drive-in, a most scenic harbor (with live theater), and WHAT theater at the new Julie Harris Performance Center and bird sanctuary. On the way there from our home are many other restaurants and interesting places. The N.Truro Vineyard has wine tasting, the library has lectures and performances, as does the Truro Commons. P-town is six miles from our door. It is even walkable along the bay beach if you plan it by the tides. Whale Watches, fishing boats, The Province Lands Information Center (and Museum), live theater by Provincetown Players, cinemas, musicalsm gay life, art museum, galleries, antique shops and street performers abound. It is a foodies dream town. It has great beaches, great fishing,whale watches, bicycle trails, Art's Dune Tours. The Truro- P-t shuttle provides hassle free for very little money. It runs back and forth from early AM to about 11 PM. PROVINCETOWN HARBPR IS ONE OF THE WORLDS MOST BEAUTIFUL! 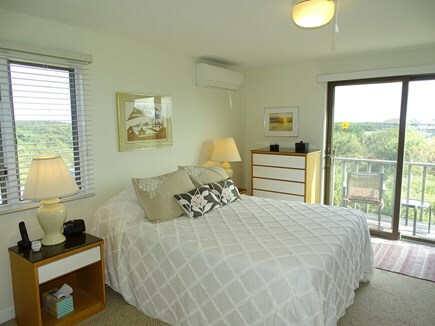 We take pride in the fact that we have a great number oF repeat renters every season for whom this property has become ''their little piece of heaven,'' special enough for them to consider it their home away from home. Yes, our home has WiFi! Yes. there is an outside shower house with hot and cold running water. We no longer supply sheets and towels but refer you to an excellent rental company nearby who deliver and pick up. We have a passcode lockable storage shed adjacent to driveway to hold your bikes, strollers, etc. Full basement is another option. 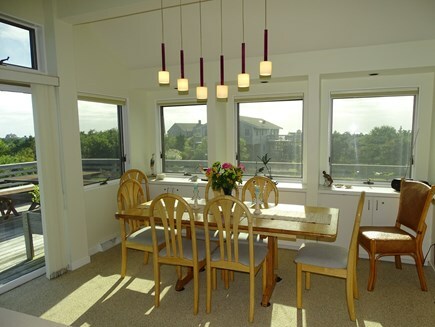 Find more reviews on Homeaway but nothing beats WENEEDAVACTION! Additional availability info: Multiple week discounts may apply. Watch for last minute cancellations. This is a Saturday to Saturday vacation rental. Long-Term Rental (1 month or more): Labor Day weekend to mid September discounted but deposit and $300 cleaning fee per week remain fixed. Additional pricing info: cleaning fee $300 per rental, refundable damage deposit, State and local taxes of 12.45% will apply. There is ground-level entry but to have full access to all the rooms on all four levels you will have to be able to climb stairs. I must say that our stay at SkyBluePink was amazing. 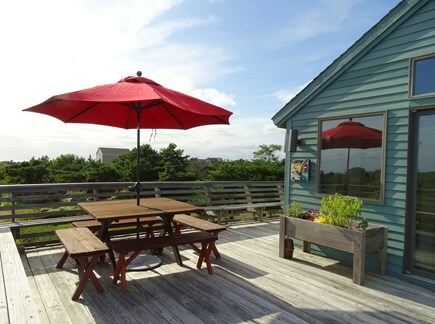 It's location was ideal between famous Ptown and Wellfleet, a lovely small town for shopping. Truro's also charming with it's harbor and of course, Mac's Seafood. We had it all, just minutes away. This is a great property and setup for families. 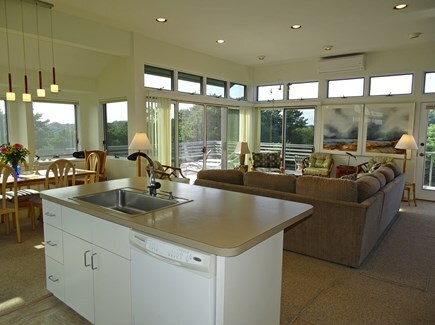 The open floor plan allows everyone to spread out and enjoy themselves. The wrap around deck and windows throughout give great views of the neighborhood with the bay off in the not so distance. It's a quick walk to the neighborhood private beach on the bay side where you can walk for miles and enjoy the views. 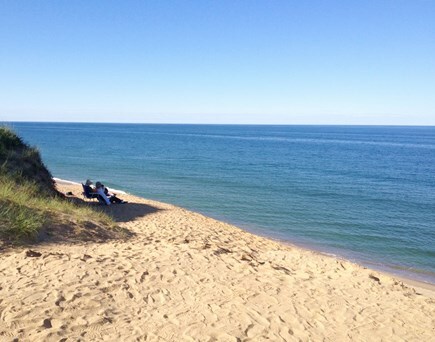 If you'd rather be on the National Seashore, it's a quick drive to the beaches. 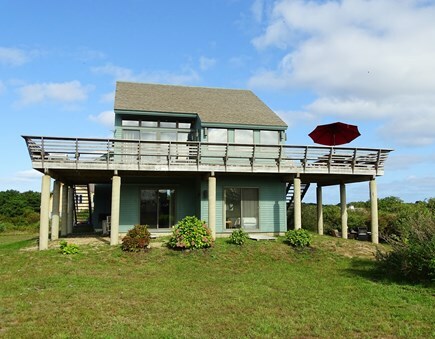 The house is close to Provincetown making it easy to get into town but its' neighborhood location makes it feel secluded and private. The neighborhood is nice and quiet. Great time. 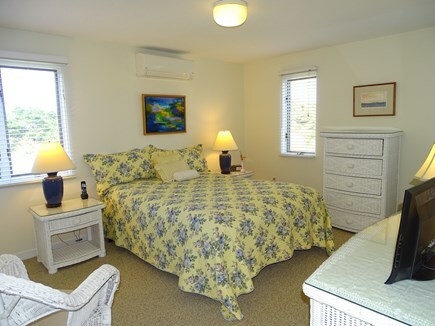 Comfortable, clean, we enjoyed access to private beach, and to Race Point and P town. House is great and clean with all comfort needed. Nice garden, nice neighborhood, nice views to beach. Second time in this house and will be back. Perfect accommodations for a couple with 2 children and a single parent with one child. 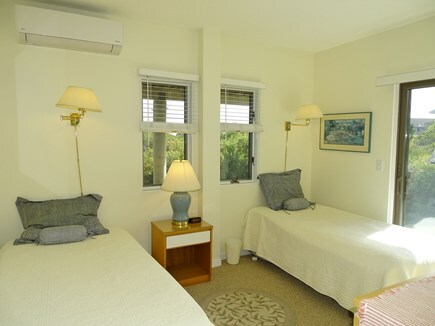 The two main bedrooms worked perfectly for the adults with their own bathrooms (however I used the outdoor shower). 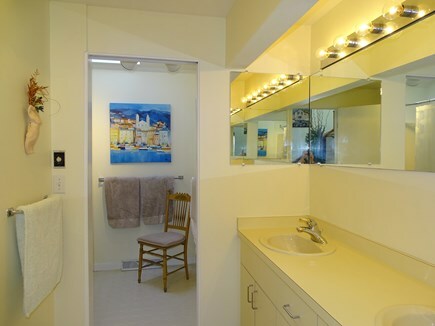 The lower level was perfect for the kids with 2 comfortable sized bedrooms and their own half bath. The top level offers my style of living with one great room so no one gets left out of the conversation while cooking dining or relaxing. The Sky Blue Pink house is a beautiful place. Just near enough of the beach and the bay. Far enough to see wonderful sunset and have a wonderful view day or night. It is a cosy and a comfortable house. It is a place you remember, sad to leave and dream to get back. No other words necessary: for us, IT IS A PARADISE!! After experiencing this house as guests of renters, we rented it ourselves so we could share with our kids, this wonderful house and all there is to do in the area. At Thanksgiving this year we were thrilled to hear them telling the rest of the gathered family how much they had loved their vacation at "Sky Blue Pink".. The memories of our wonderful week together at this delightful house will stay with us The dreams of being back again will keep us warm all winter. The flow of the house was what made it all work so well. The teenagers had their own hideaways in the little turret above the living room and in the sitting area just outside their room on the lower level. The main room upstairs is bright and inviting, The kitchen is a dream for people who like to cook. Our favorite things besides the flow; the outdoor shower, the deck sitting high and overlooking a different scene in all directions to watch sunrises and sunset, the short walk to the private beach, and the calm water of the bay, the short drive to the breathtaking ocean beaches, the town so close and so colorful, the great restaurants, the lobsters we brought in and enjoyed on the deck at the house, We loved it all and hope to be back again and again! Our family has been coming to this house for so many years our grandchildren think they are back at their summer house! They even noticed the "frog" bath mat in the shower was gone (it wore out). What is there to say when our family thinks they are coming back to "their" house for another week's vacation. We even go to the same restaurants year after year.